The 1988 United States presidential election in Oregon took place on November 8, 1988, as part of the 1988 United States presidential election. Voters chose seven electors of the Electoral College, who voted for president and vice president. 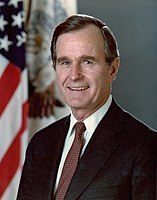 Oregon was won by the Democratic nominee, Massachusetts governor Michael Dukakis, over the Republican nominee, Vice President George H. W. Bush. Oregon was one of just ten states won by Dukakis in an election won by Vice President Bush. It also marked the first victory by a Democratic presidential candidate in Oregon since 1964; Democrats have won every presidential election in Oregon since, although Republican George W. Bush nearly won the state in 2000. Bush's loss marked the first time that a Republican was elected President while losing Oregon since Ulysses S. Grant in 1868. As of the 2016 presidential election[update], this is the last occasion Washington County has voted for a Republican presidential nominee. ^ "Oregon Presidential Election Voting History". 270ToWin.com. Retrieved June 12, 2012. ^ "1988 Presidential General Election Results - Oregon". Dave Leip's U.S. Election Atlas. Retrieved June 12, 2012.